This 1750-square-foot custom-crafted rustic lodge is enhanced by a very large see-through fireplace created using beautiful local and hand picked rock. There is a cozy location on one side to read, relax and enjoy the fireplace. The other side has a leather loveseat with large ottoman and two very comfortable wooden rockers. Another great spot for reading, relaxing, conversation with family as well as a flat screen TV with many DVD's to choose from. Outfitted with many hand-peeled log accents and rustic iron work, this upscale cabin evokes the feeling of the great camps of decades gone by. Located in a large meadow, Lupine Meadow Lodge has wonderful views of the peaks of Glacier National Park. With many windows and four decks, you will have ample opportunity to relax and appreciate the beauty. The cabin is surrounded on two sides by the Flathead National Forest. As the North Fork is remote and pristine, this high-tech cabin provides its own electricity from an underground generator and solar panels as this location is off the grid. Because of the remote location we strongly recommend you contact us via the 'Ask Owner a Question' link on this page before booking this property. 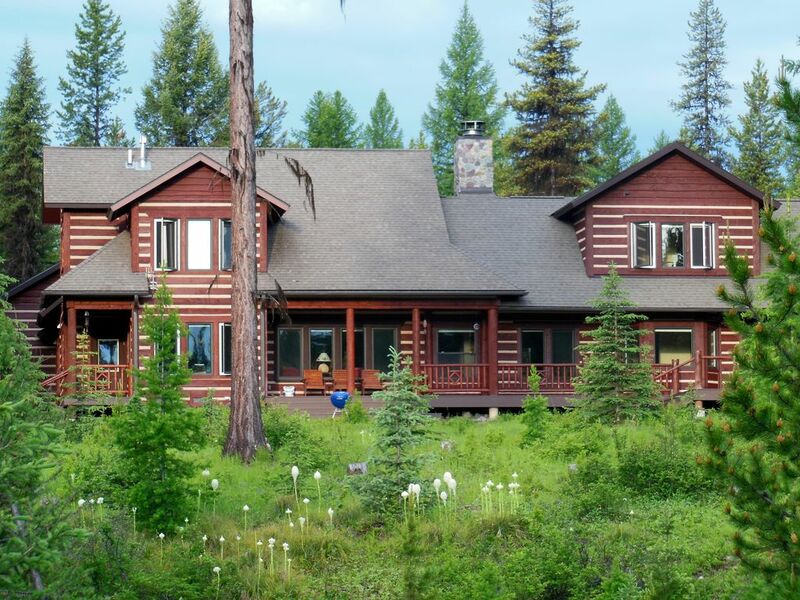 Lupine Meadow Lodge is located in the North Fork Valley of the Flathead River in Northwest Montana. The North Fork is designated a 'Wild and Scenic River' and its beauty is startling. The cabin is located on the western border of Glacier National Park and is six and one-half miles north of the small outpost town of Polebridge. This picturesque town is comprised of a Mercantile which has basic provisions and a renowned bakery, The Northern Lights Saloon (restaurant and pub), a few rustic cabins for lodging, and approximately 40 residents. The Northwest entrance to Glacier National Park is accessed through Polebridge and is only about 8 miles from the cabin. The North Fork is a special place and a true back country enthusiast's paradise. Known as America's last true wild lands, the North Fork is home to abundant wildlife including grizzlies, gray wolves, moose, elk, deer, mountain lions, snowshoe rabbits, bald eagles, and hawks. There are many outdoor activities including excellent fishing on the North Fork River or the nearby mountain lakes and streams, hundreds of miles of trails, and old logging roads on which to hike and mountain bike. Lupine Meadow Lodge also provides excellent access to Glacier National Park. Whether your desire is to get away and relax, or to make the most of the back country, Lupine Meadow Lodge will be sure to make your vacation remarkable. The lodge has a bedroom downstairs with a queen bed and a bath with a shower. There are two bedrooms upstairs with a queen bed in the master and two twin beds in the second bedroom. The bath upstairs has a tub/shower combination. Keywords: lodge, wilderness, Glacier National Park, Polebridge, grizzly bears, wildlife, river rafting, hiking, kayaking, custom lodge, log cabin, upscale lodge, private, wireless internet. We both worked at Many Glacier on the east side of Glacier National Park in the 70's. We met when Sue was working for the concession in the coffee shop and Greg was in maintenance and took coffee breaks. We returned the following summer and a married couple and became a ranger and Greg continued in maintenance. We spent 8 summers at Many Glacier hiking and climbing all over the park so we know it well. Our son Merritt was named after two of our favorite mountains in the park. Fast forward to 2004. We were interested in purchasing property near Glacier and decided on this location with it's beautiful views of Glacier and the rustic lodge feel of the cabin. We have since expanded the cabin into a lodge with added personal space and a three car garage. We made sure the expansion looked like it fit with the original structure rather than like an add-on. We loved how quiet it was and there are no other neighbor buildings visible. You can sit on the east side deck looking at the peaks of Glacier and hear the wings of the birds as they fly over. This lodge is in a large mountain valley at 4000' elevation. To the west is the Whitefish Range with peaks to 8000'; to the east is the Livingston Range with peaks to 10,000', a vertical mile above. The North Fork is officially a wild and scenic area. Properties are off the grid; we have a large generator (underground) and solar panels which supply electricity in a completely automated system. Polebridge is the historic village 6.5 miles south of the lodge. The Mercantile (historic register) offers pastries and unique gifts and the Saloon has good food and choices of beer on tap. The North Fork of the Flathead River is one mile east of the lodge, one of the first rivers designated a Wild and Scenic River in the US. There is not a lake on the property but spectacular Bowman Lake is about 12 miles from the cabin. It's great for swimming, (cold) fishing, kayaking and hiking trails along lake shore. A spectacular view of the Livingston Range of Glacier National Park peaks is what greets you on the large east porch as well as a large open meadow. Welcome to Big Sky Country. The North Fork of the Flathead river is not visible from the cabin but is only about a mile as a crow flies. You can walk or drive to it...about two miles. If you wish to get away from it all and enjoy the great beauty Mother Nature provides, this is the place for you! It is so quiet you can hear the wings of the birds, while sitting on the deck, as they fly over. We loved this property more than any other we have ever stayed at. It is thoughtfully and beautifully decorated, it is near an entrance to the Park (Polebridge) that has easy access to Kintla and Bowman lakes. We enjoyed the merc and the saloon and enjoyed being away from it all. Our kids loved it! We want to come back someday! In our travels we have stayed in remote locations and in very comfortable homes, but the Lodge was the first time we ever experienced both at the same time. This home is very well-constructed and solid with large, functional spaces and comfortable furnishings. And the owners have thought of every little detail from a fully-stocked library of books to clean windows to take in the views. During our visit the daytime temperatures were in the 90s and smoke was washing across the entire West, but it stayed comfortable and cool in the house. We experienced privacy, tranquility, and plenty of creatures running about in the field. We really enjoyed hanging out in Polebridge, only a short drive from the Lodge, as well as driving to Glacier and the National Forest. We had no problem with the owners' request that we conserve water and energy and doing so did not detract from the experience at all. In our view it's beyond luxurious to have hot and cold running water, a full stove, and climate control while off the grid. The owners clearly are very attached to their Lodge retreat and it shows in the impeccable quality - so we are grateful they were willing to share it with us! Thank you Rachael for your kind review. We are so happy that you enjoyed it even though it wasn't under the greatest circumstances with all of the smoke in and around Glacier. We hope you can return another year when the area isn't plagued with the terrible fires. Having long hoped to visit this wildest corner of the lower 48 states, it was a great pleasure to stay at Lupine Meadows. The home is the embodiment of what is great about the national parks at their best. The cabin (it is quite grand for that name) has a beautiful setting (the views across the meadow into the park! ), meticulous design integrated into the environment, and is extremely well outfitted. The fact that the home was designed and cared for by long time Park rangers is clear. The love of Glacier is expressed in the home and the care of all the details is evident in all aspects. From the massive log supports of the soaring ceilings to the gorgeous river stones in the fireplace, the home is an extension of the classic Glacier aesthetic. However, it is also very thoughtfully outfitted, especially important given its distance from modern society. Many rentals look great in the photos, but have slapped together details. Here that is not the case at all. Even the kitchen knives were well-sharpened (almost never happens!). Polebridge itself is charming and lived up to expectations. We rafted the North Fork, ventured into the Park's backcountry, and even saw a wolf (in addition to to the usual, less mysterious natural cast of characters seen around Glacier). I am very grateful to the owners for sharing their home with us and allowing me to bring my family to this wonderful and unique corner of our great country. Thank you so much Robert for taking the time to write such a detailed and glowing review. We are very pleased that the cabin/lodge met and exceeded your expectations and you got to experience Glacier's wonders. Glacier truly is a very special place in our country and seeing a wolf is a very rare treat. To stay in this quiet, relatively remote area, on the doorstep of north Glacier was a real treat. This is a beautiful lodge with rustic touches and views of Glacier peaks. The owner Sue was very helpful, via emails & phone calls, and helped us with all our questions, so our group of 3 couples could feel assured of a great stay. This home has everything from a gorgeous fire place to heat via thermostat, to a new washer/dryer - so every comfort is there. Sue sent detailed written information about the lodge so we knew where things were and how to operate things. She also sent hikes, and places to eat & sightsee near the cabin. The comfort and style of the lodge amidst incredible scenery, fishing, privacy, quiet, wildlife and more, made for a week we will never forget. We are grateful the owners share their beautiful home with renters and appreciated all their great help. We hope to return for sure! Thank you for taking the time to do a review. We are very pleased you enjoyed your stay and felt you were well informed about the property and the area. That is always our goal. We had a very disappointing stay at this property. The owner was suspicious and fearful of our intentions of using her home (we were there for a family wedding) and repeatedly asked us how many were staying at the property, although we kept insisting no more than six would be sleeping there. The home, while in a gorgeous setting, was filled with notes of what not to do in the home ( fireplace, garbage disposal, septic system, etc). We did not have sufficient towels or toilet paper for our stay. She deducted from our deposit for a very frivolous reason, even after paying a very hefty cleaning fee. I would encourage you not to stay here. This was a challenging situation from the beginning. The guest was very stressed about the wedding when she contacted me. Since we are off the grid I always want to be sure our guests understand where they are going and that this is not just a rental, but our home. It's apparent that this guest did not take the time to thoroughly read either the agreement or the Welcome Letter I sent. We had not received their final payment a week before arriving and it was clearly stated it was required at least 30 days prior to arrival. I contacted her and she blamed me for not reminding her. I did not need to contact her but did not want them to arrive and not be able to get into the cabin. In regard to the towels it is stated in the Welcome Letter how many towels are supplied per person during a one week rental and there is a washer and dryer available in the cabin. As for the toilet paper, we keep extra under the bathroom sink but I will check on that. I never want people to run out! The guest claimed our housekeeper arrived 30 minutes prior to the check out time, but that was not the case. She arrived 30 minutes after the time and the guests didn't vacate until an hour after the check out time. The time was clearly stated in the agreement, explained afterward and even mentioned in an email right before their arrival. In the 11 years we have opened our home to guests, this is the first time we have ever had someone unhappy with their stay or my communication with them. It is only the second time I felt the need to deduct money from a deposit. That amount will go directly to our housekeeper. I encourage you to read the other reviews and come to your own conclusions. I spend a lot of time talking and emailing with potential guests, as this location is not appropriate for everyone and I want people to have a wonderful experience and vacation. Off the Grid and Off the Charts! Our family of four absolutely loved this house. The cleanliness, upkeep, and decor exceeded all expectations. Unlike with most rental properties, this house really felt like the owners had entrusted us with their own home. The three bedroom layout and large dining / game table with views of the mountain range worked perfectly for us. We had several spectacular, sunny days when the nearby hiking and the views from the house were stellar. And we had two rainy days, but we made the most of them by playing board games and reading in the cozy house. The location also served as a perfect basecamp for launching a backcountry trek into the Boulder Pass / Hole-in-the-Wall area of Glacier National Park. We would absolutely return the next time we are headed to the North Fork. Many thanks to Sue for being so responsive and proactive about the rental arrangements. Thank you so much. II'm so happy you had such a wonderful experience! The North Fork river area is an official wild and scenic area. Properties are off the grid and supply their own electricity. Glacier National Park is our front yard and the Whitefish range our backyard. Activities such as hiking, climbing, float trips, fishing, kayaking and canoeing abound. The community of Polebridge is like visiting the old west. The Mercantile (on the historic register) is famous for its freshly baked huckleberry bear claws, cookies and hot sandwiches as well as a variety of keepsakes to remind you of your trip. (lodge owner sells her art in there). The Northern Lights Saloon serves delicious food as well as a variety of beer, wine and soft drinks. There is a gas pump at the Mercantile but it is recommended that you fill up and do your grocery shopping in town for greater variety. Seven night minimum. Additional nights prorated. A portion of the lodge is locked off for owner's use only. Owner is not on the premises when guests are visiting.